Some weeks ago I asked for your help in submitting user-based ‘evidence’ to an expert group tasked with improving mental health and emotional wellbeing support for care-experienced children and young people. I asked you to tell me about the clear and achievable ways in which you thought mental health services could be radically improved for adoptive families. improve professional expertise particularly in trauma and early adversity. Many of you continue to report that when you can access child and adolescent mental health services your child’s early life experiences are not explored or seen to be relevant and you feel blamed for your child’s difficulties and disbelieved. The more experience I gain and the more I learn, the stronger my view that adoptive families, as well as others who parent care-experienced children and young people are a valuable, knowledgeable and essential part of healing and growth. It makes no sense in health or economic terms to work against the willing, the able and the emotionally invested. 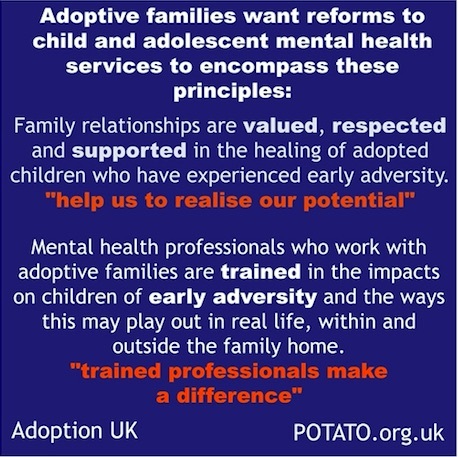 Thank you to everyone who responded, including members of Adoption UK and POTATO. Thank you also to the professionals who checked out our principles and who gave encouragement and advice. Please feel free to use and share this graphic if you’d like to.